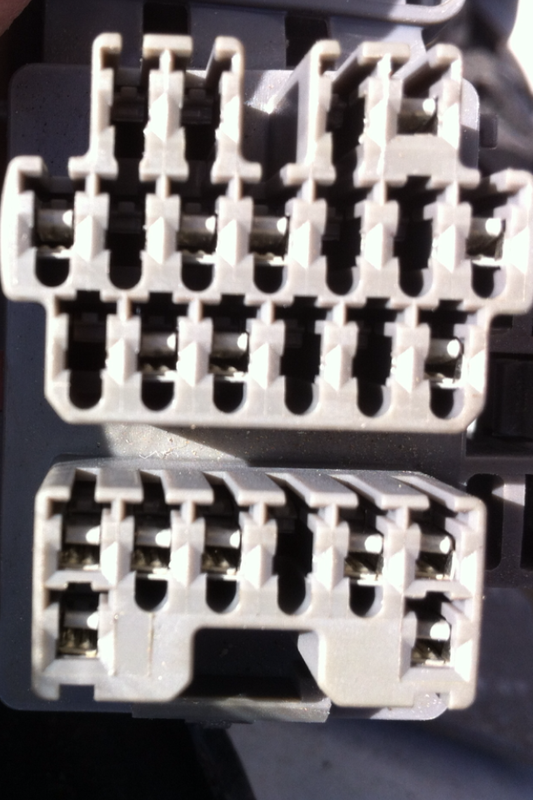 Found diagnosis box on my Mazda 626, 1998, 1.8 European version, but there is no TEN pin as you can see in picture. How can I get the CEL codes? Also I need to get the ABS codes, as I understand, I need to connect the first and third pin of the second row? 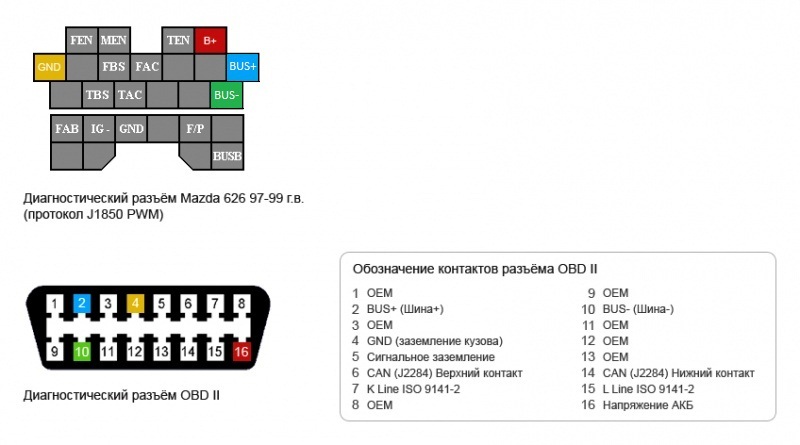 98 is OBD-II, look for a plug inside the car below the steering wheel. I do know some of those did not have the OBD-II plug but hopefully you have it. I believe I have the exact same diagnosis plug that you have, and I can not find any OBD-II plug inside the car, below the steering wheel. Is there any way to do a diagnosis on this car? Thank you. I read that, but I still didn't get it. Seams to me that he didn't get the solution that he needed neither. 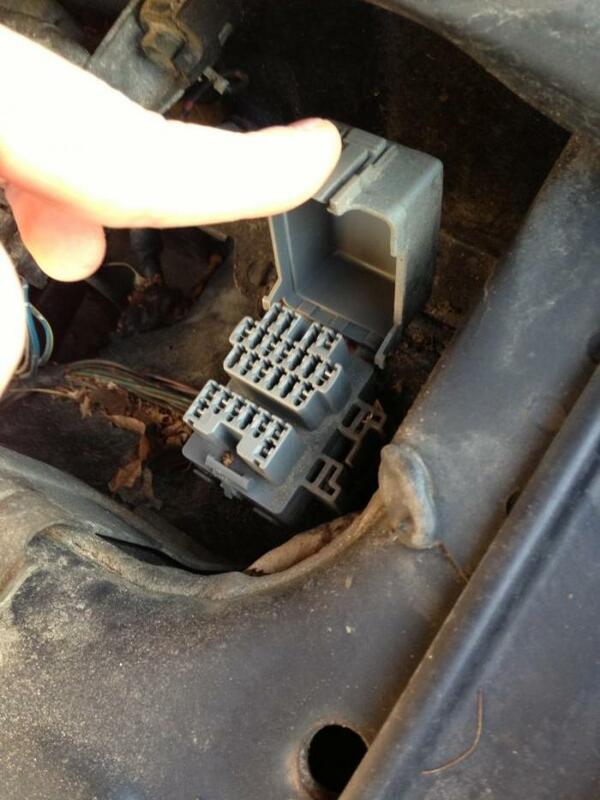 That looks like the same box in the Miata, so it is possible the pins have the same function. However, that doesn't fix the OPs issue, does it? If you don't have the TEN pin (looking at the picture it seems the OP does not), I'm not sure. That is the same plug, but I have no TEN - so I haven't found a way to do the diagnosis. This is all I can find at the moment. I did ask a dealership. No luck... 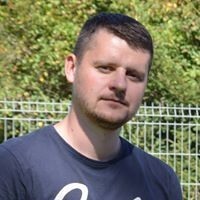 They thought it was a standard ODB connection - and I told them it isn't. I said it is a different animal. Then they just looked at me... It looked like he had never done anything with old Mazdas before. 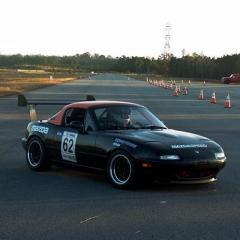 @XeNoMoRpH : Ok, so the Self-Diagnosis Checker is a Mazda-thingy? Have you checked for an EEC-IV diagnostic connector? The 2.0L automatic is missing a lot of pins too. Down near the headlight is a trapezoidal connector inside a rectangular housing labeled EEC TEST. It's the only thing I can think of for why it would be missing that TEN pin + no OBD-II. Perhaps it started out life as an automatic and someone converted it to manual. Worth a shot. Is there a pin diagram in the diagnostic box lid like shown in this video? We might be able to figure out something if we can see how the pins are labeled. I'm surprised that worked. 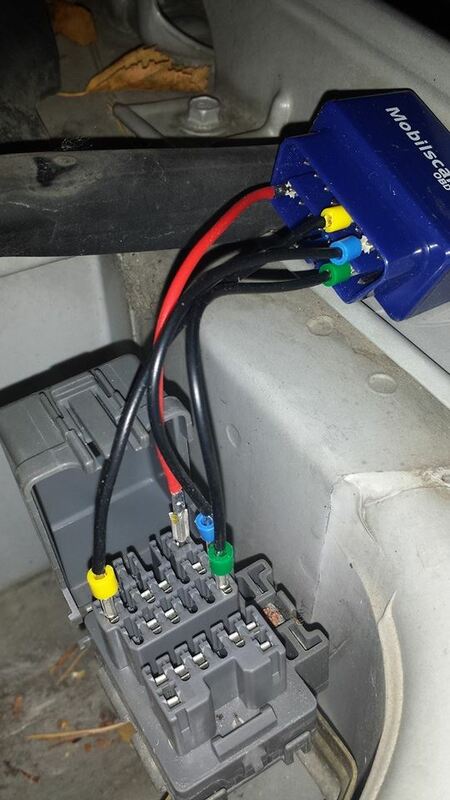 I've always suspected there was a way to pull data from the European bus lines but never would have thought it would hook straight up to an OBD-II connector. That's awesome news! Thank you! I'm using this for a while now. Standart obd2 software does not show all error codes (tried Torque for android), but Forscan works great and it is constantly updated. Woot? Would this be possible to the US OBD-1 cars too? Or are you guys missing the BUS pins? Did anyone ever figure out how to pull codes on this type of dlc without wiring up to an obd-ii scanner with the forscan software? Any way to pull the codes with just a multimeter or led? I don't think so. A BUS is a data communication line and will likely have a data protocol to communicate with it. It's expecting to "talk" with a networked device. It needs a specific response string before it starts outputting data and it wouldn't blink out error codes in the way you hope. It would spit out 8-bit data (byte strings) and very very fast to the point your test light might seems as if it's going crazy. Since it works with an OBD-II device that means it's likely programmed with the CAN BUS system and is actually a real OBD-II equipped vehicle but doesn't have the OBD-II communication DLC under the steering wheel. To use a test light you would need the TEN pin sorry. Make sure you check for that EEC-IV trapezoidal diagnostic connector near the headlight just to be sure. US vehicles that do not have a TEN pin in the diagnostic box is because it was moved to another external test port (EEC-IV) trapezoidal plug. There are instances of members here that have the gray box DLC and an EEC-IV test connector but most of them are from South America. In those instances they did not have BUS pins though. If you have the BUS pins it means you do not have an EEC-IV connector because EEC-IV does not have BUS pins. Since you have a 1998 you likely have EEC-V not EEC-IV and that means you have OBD-II. EEC-V ECU's are programmed with Ford/Mazda implementation of OBD-II. 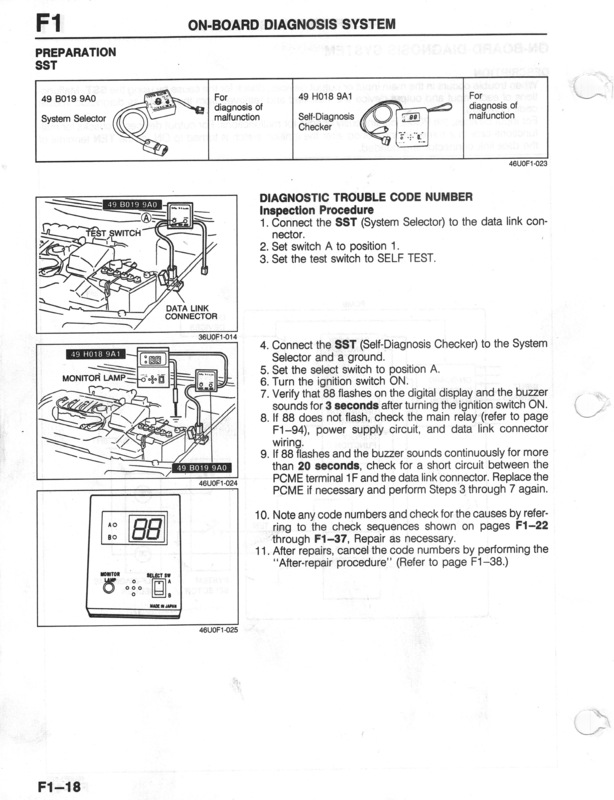 If you have BUS pins you'll need to wire up an OBD-II DLC as shown on the first page of this topic. You don't have to use that specific product (forscan) you should be able to use any OBD-II connector of your choice and software of your choice. Torque and ELM327 is a popular choice for people with Android smart phones. You could also use any off the shelf OBD-II scan tool that you might purchase from an automotive hardware store as long as you wire it up correctly. In the meantime I'm going to try some homebrew seafoam through the brake booster hose to try and help smooth out my idle. I already used the air adjust screw to raise the rpm to 750, but the idle and acceleration are both still rough, and it's anyways just a bandaid solution. You can't adjust the air idle screw unless you are in diagnostic mode. The ECU will simply compensate for the air adjustment so of course there will be no change, in fact it can only make things worse. If you manage to raise/lower the idle that means it's outside the range of compensation and you might just peg your A/F full rich or lean by doing it, not good. The only way to make things better is by calibrating it using an OBD-II live data scan tool while in diagnostic mode. Since you say you don't have one yet then obviously you'll want to address that when you get your scan tool up and running. That kind of procedure is usually only available in high end expensive bi-directional scan tools. You might end up needing to take it to a professional shop to do the procedure anyway. Have any suggestions for such a tool? In the 97 European WSM it lists a procedure for adjusting idle without a scan tool or shorting any pins - basically it just says to turn the screw ( while at the same time emphasizing that it will lead to substandard performance ).